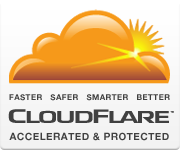 CloudFlare mitigates DDoS attacks, including those that target UDP and ICMP protocols, SYN/ACK, DNS and NTP amplification and Layer 7 attacks. Our global network has defended against sustained attacks over 400Gbps. If you're under DDoS attack, we can get your site back online within minutes. As web attacks get bigger, our network offers high capacity to mitigate the attack and protect your website from DDoS attacks, even ones exceeding hundreds of Gbps. CloudFlare has built a best-in-class, global infrastructure from the ground up with no legacy software or hardware.